All you need to run a successful Diabetes and Heart Health checks at work is here! The most common types of cardiovascular diseases include high blood pressure, stroke, heart disease and the clogging or narrowing of the heart's arterial walls and blood vessels, leading to a heart attack. Being overweight or obese increases a person's risk of developing type 2 diabetes. Weight loss is a common recommendation for treatment for this type of diabetes. The more you smoke the higher the chances of you developing type 2 diabetes. Smoking (Quit Now) causes a lot of harm to your body and can raise your risk of heart attack or stroke. People with Diabetes and high blood pressure are more at risk of developing cardiovascular diseases such as heart attack or stroke. Diabetes and heart checks are becoming an ever-important part of employee health checks in Australia. In 2016, the Australian Department of Health has estimated that 5.1 per cent of all Australians have diabetes. Heart disease is common in working-age adults and is said to be responsible for costs in occupational terms. Employers can play a role in the prevention of these deadly diseases by availing of Corporate Care's diabetes and heart health checks. 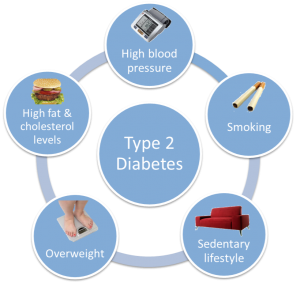 Type 2 diabetes is a serious disease that affects millions of people around the world. Although genetics and family history plays a large part, lifestyle can also dictate the likelihood of a person acquiring this debilitating condition. Small modifications can be made in terms of lifestyle, exercise and eating habits to lessen the risk of developing type 2 diabetes or heart disease. One-on-one employee health check assessments can significantly reduce the likelihood of your staff developing such illnesses.